Cobblers boss Chris Wilder is targeting a happy end to 2015 as Accrington Stanley come to Sixfields on Monday afternoon (ko 3pm). Northampton wrap up what has been an eventful year with the Sixfields showdown, and Wilder is hoping to go into 2016 on a positive note. 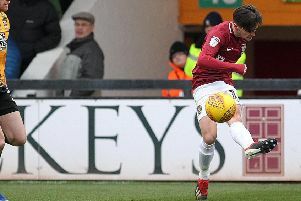 The Cobblers, who saw their Boxing Day clash at York City postponed due to a waterlogged pitch, go into the Accrington match still in the top three of Sky Bet League Two, thanks to Portsmouth’s 3-2 defeat at Leyton Orient. Plymouth Argyle are now clear at the top thanks to their win over Yeovil, while Oxford United leapfrogged Wilder’s men courtesy of their victory over Exeter City. Town are still in great shape after what has been a fantastic first half of the season, and Wilder is looking forward to getting back in action. “Hopefully we will have another big crowd in on Monday and we want to finish the year off on a high,” said the Cobblers boss. “We’ve had a great 2015 but now is the time we really want to kick on again. Wilder is expecting a tough battle against an Accrington side still very much in the promotion picture themselves. Stanley also saw their Boxing Day fixture against Carlisle United postponed, and that meant they dropped out of the play-off places thanks to a draw for Bristol Rovers and a win for Wycombe Wanderers. But they are still eighth, and only seven points behind the Cobblers with two games in hand. “It’s a big game,” said Wilder. “Accrington are going really well and the game we had at their place earlier in the season could have gone either way. “Since then things have changed a bit financially for them as well, and that is great for John (Coleman, Accrington manager) because he has always had that to battle against.